In this variation on Snake in the Eagle’s Shadow, Lee Yi-min plays the dopey orphan kid who works as a dishwasher for an unscrupulous boss. He lives with a stern, blind grandfather who teaches the boy discipline and ‘butterfly’ style kung fu. A plot is revealed involving the murder of local beggars by the very same nutcase who slaughtered Lee’s family 18 years previously, so revenge is soon on the cards, masterfully exacted in a flamboyant duel in the middle of nowhere. Typically, this cheap chopsocky comes badly unhinged during the dramatic moments and slapstick routines, with some atrocious dubbing not helping. But the lengthy fight scenes are good enough to balance things out. 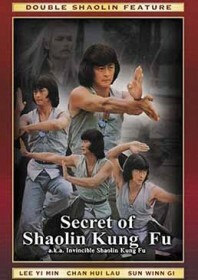 It’s wholesome kung fu fun, if a little more unsophisticated than most. Quite what Shaolin has to do with it is anyone’s guess.